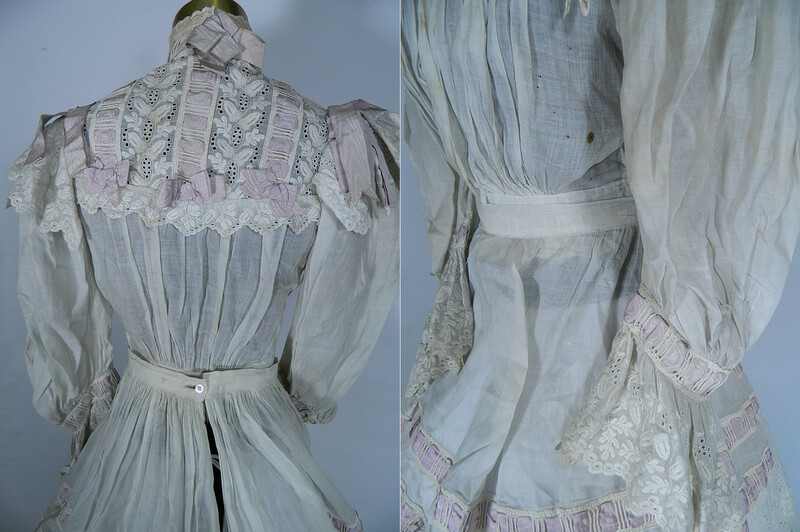 This antique Victorian era white batiste acorn embroidered lace blouse, skirt morning dress dates from 1870. It is made of a white cotton batiste fabric, with hand sewn whitework done in a raised padded satin stitch embroidery and drawn work. 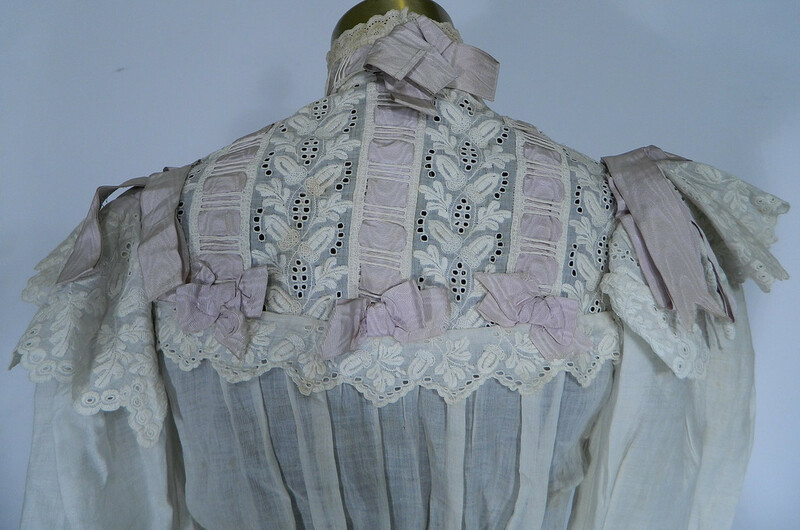 There is a lovely lace acorn oak leaf embroidered design and lilac silk ribbon weave trim. 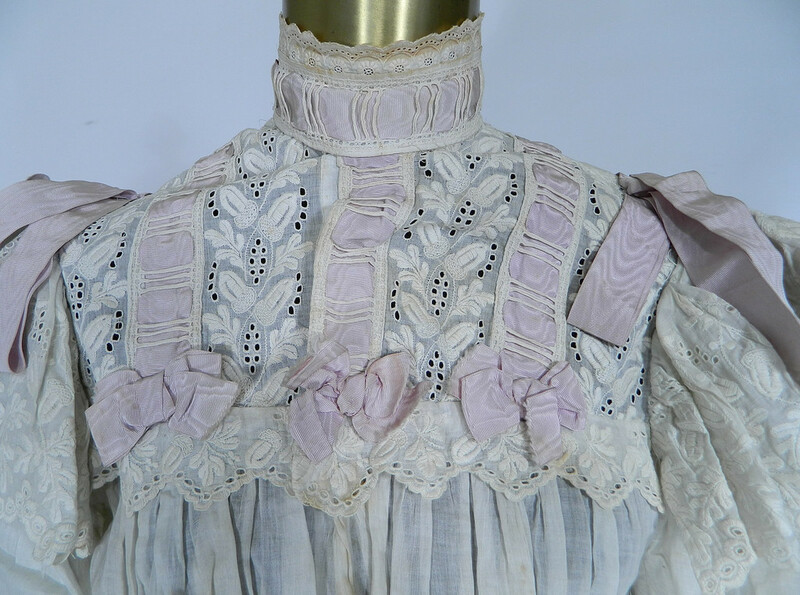 This magnificent morning dress includes a high collar blouse, with long full sleeves, flared cuffs, scalloped edge ruffle trim shoulders and tiny buttons down the front for closure. The top measures 16 inches long, with a 22 inch waist and 32 inch bust. 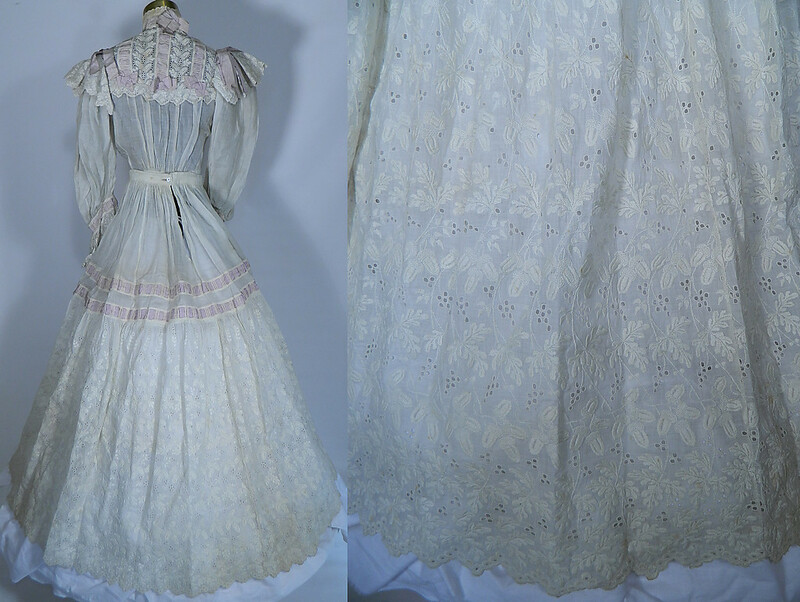 There is a matching embroidered fabric long full skirt, with button back closure. The skirt measures 38 inches long, with a 22 inch waist. It is in good wearable condition, but has not been cleaned with a few small faint age spot stains. 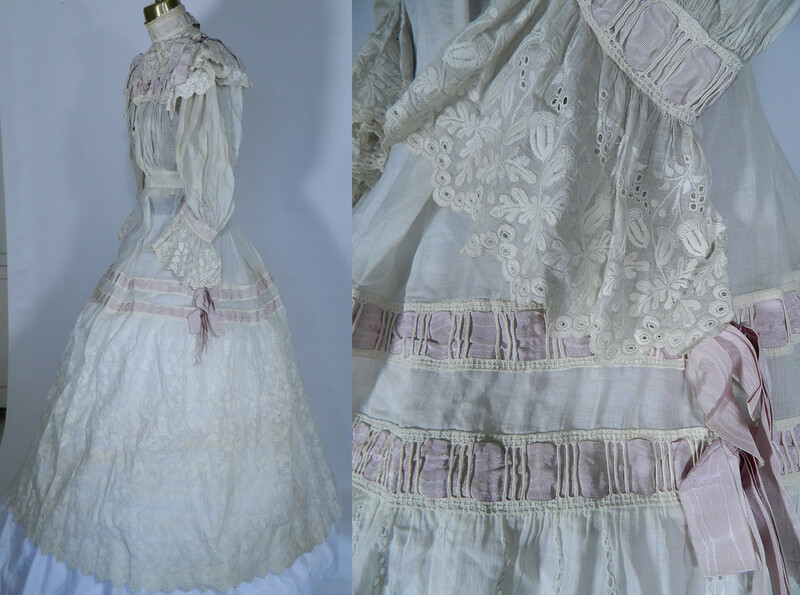 This is truly a rare and exceptional piece of wearable textile antique lace art which could be worn as a wedding gown! 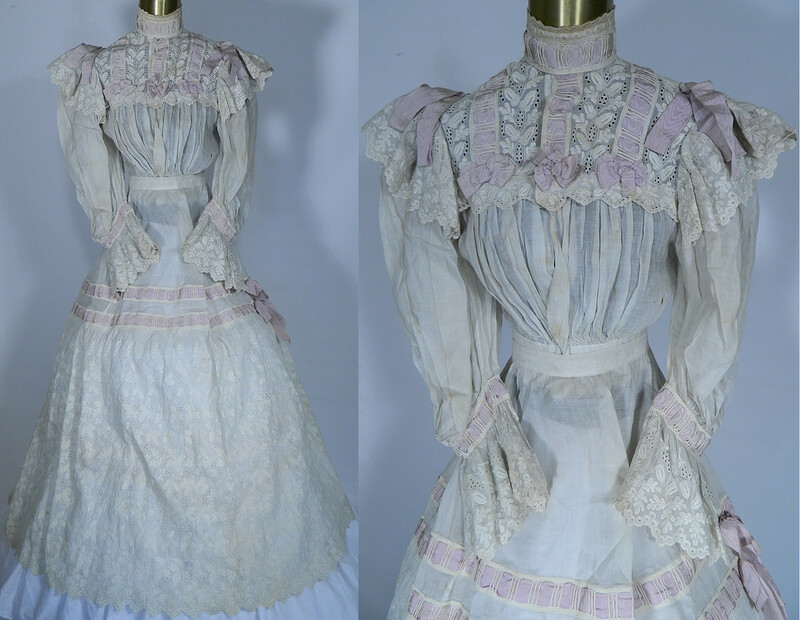 So very clearly not 1870's, but a lovely late 1890's/early 1900's dress. I'm putting this around 1898-1902. I mean, heck, it even has the stereotypical bow on the back of the neck!